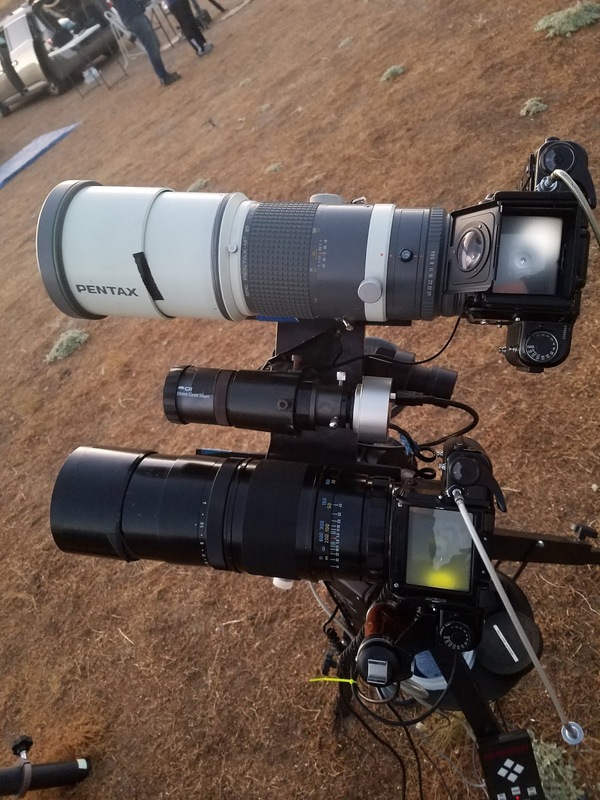 During some of the earlier efforts to gather astrophoto film gear in medium format, I'd picked up a Pentax 67 to K mount adapter with a knife edge. This made me say... hmm, maybe I could use the Stiletto again, if I ever found a way to mount a lens so that I could hold the lens steady. Again, this idea was forgotten until much later. In the last few years, I finally had some Pentax 67 lenses that featured their own mounting point. This finally meant that I could use the adapter with a smaller DSLR or other camera without worrying about sag or other issues. This was how I shot my pictures of the eclipse: I used the 400mm EDIF lens with a DSLR and was happy with the results. I'd focused using live view on a sunspot, so all was good. However, I was still trying to get some film images with the setup. Using the 400mm EDIF and the older Takumar 400mm lens side by side, I was hoping to do black and white and color of the same targets. I was still plagued with issues of focus - mostly with the older Takumar lens. Since I wasn't using the setup except at GSSP and Calstar, the opportunity to troubleshoot was rare. 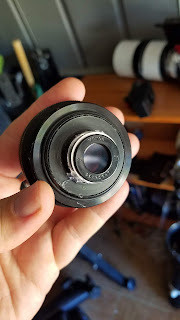 Eventually, I was able to figure out what I had been doing wrong with the Takumar lens: I needed to use a yellow filter inside the lens to reduce star bloat and I had to install this filter assembly properly. I'd had this assembly backwards for more than a year! At the fall Calstar 2017, I finally had good star images - sharp enough to show the problems of poor polar alignment. At spring Calstar 2018, all these problems had been resolved and the Takumar was set up perfectly. However, the EDIF was a different story. No matter how I tried, I couldn't get great star images. Mostly this was masked by tracking errors or other issues. 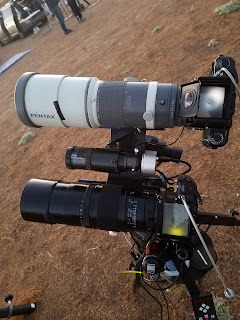 At the star parties, I would use a loupe or other magnifying device to see the available star images as clearly as possible. This, of course, meant that I had to trust the view on the ground glass as being accurate. Besides, I'd sent these bodies off for CLA and never really used them on a terrestrial targets. At the most recent GSSP, I asked Isabel De La Cruz to assist with finding focus, since her younger eyes were better able to see the star images as I have been fighting changing astigmatism over the recent years. She confirmed that she could see sharp stars and we locked down the lens. We never checked the view again when swapping bodies, so we missed the opportunity to catch the mistake. Last week when I received the Ektachrome back from The Darkroom and was able to do a deep scan on it, I could see that - yet again - the star images were soft. Late last week, I decided that it was time to do some objective measurements. Readying the Stiletto device, digital depth gauge, and loading a 67 body with a dummy roll of film, I was set to take the best measurements that I could. First, I established what the real flange to film surface distance was for the camera that I was using. This step would eliminate any variance from standard for this camera. Next, I measured the distance from the ronchi screen on the Stiletto with the 67 to k-mount adapter in place. Surprisingly, there was an offset of a few hundredths. All this time, the device was miscalibrated. The next step was to try to figure out how to calibrate this obsolete device. Luckily, an ancient pdf was available on the internet and I was able to finally break the locktite. In the original pdf, the adjustment tube was supposed to be sealed with blue locktite - with red used on other parts. Unfortunately, the application was reversed. Thus, I was only able to get the focus threads released after significant effort. For reference, the grating of the Ronchi screen is on the flange side, not the side that is pictured in the above photo. I was able to see the grating with a loupe and could feel the grating with the tip of a wooden toothpick! As seen above, I tried using a bit of temporary glue to hold the screen in place. I removed this after doing more precise measurements. Eventually I'll secure it with blue locktite. After get the Stiletto recalibrated based on the measurements of the depth gauge, I tried the 400 mm EDIF lens on Vega. Strangely, the lens barely reached focus - well past infinity. Hmm, this never seemed to be an issue before - what was the problem? This lens has a slot for a 67mm filter, which I've kept empty. After inserting a B+W 486 filter, the Stiletto showed focus very close to the real infinity mark. Very curious! Now that I have an externally measured infinity spot identified, I'm asking myself - maybe the focus screen of the Pentax 67 is poorly adjusted? 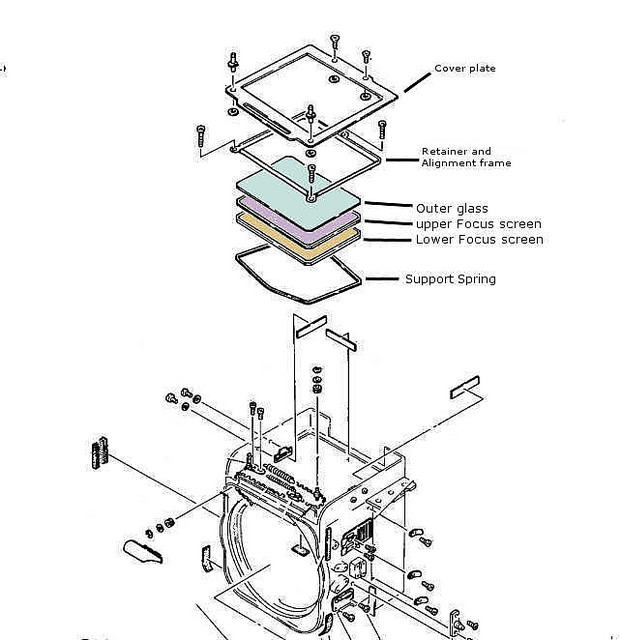 I noticed that the screen appears to be spring-loaded - allowing slight vertical movement when pressed. Maybe it's time to consider doing some shimming? This image suggests that I may be able to do the adjustment with the camera attached and looking at the night sky. If this works, then I may want to check the other cameras. Maybe this will improve the hit rate of some of my landscapes. I think that what I'll do a bit more testing before opening the camera. 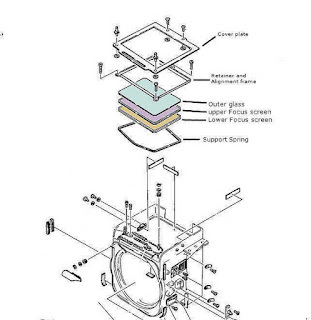 I think I'll use the adapter to try using a DSLR with live view to focus on a test chart, then switching to the 67 body to check optically. I'll need to match the film plane and sensor distance so that I can keep the sensor in the same place, or just use the EDIF!